WASHINGTON—Three years ago, Francisca Awah Mbuli took a job teaching English in the Middle East, thinking it would help get her family on track financially. But, when she arrived, she discovered there was no such job. “I was trafficked into slavery as a domestic worker where I didn’t earn anything, bore inhumane treatment, and sexual abuses,” Mbuli, a native of Cameroon, said at the State Department on June 28. “When I said that I wanted to go home, they told me that I had a debt of $3,000, which I had to pay, and then pay my flights back home. This was a lie,” she said. Mbuli said all the females she met there had been promised jobs with higher pay than they could ever have received in their home countries. Mbuli said she escaped and returned home with the help of an NGO, but many of the women were not as lucky. She has since set up an NGO in Cameroon called Survivors’ Network, which is comprised of trafficking survivors. The NGO raises awareness, helps victims escape their trafficking situations, and offers temporary housing, vocational training, and other essential services that survivors need for successful reintegration. “It’s particularly important that, once victims are rescued, they have the supportive network and infrastructure that they can lean on to prevent being re-trafficked,” Mbuli said. Mbuli’s is only one of 25 million stories of human trafficking happening in the world today. 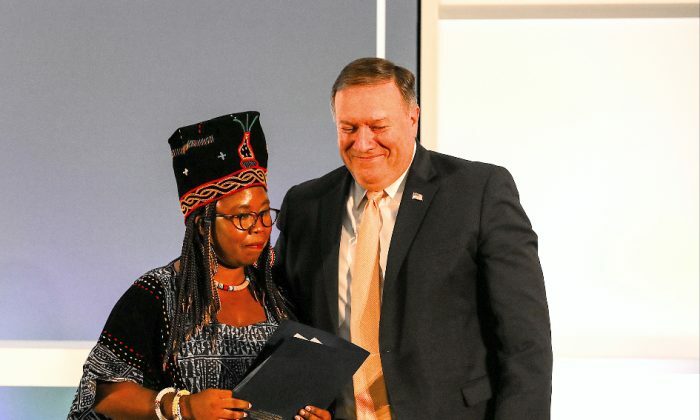 The State Department honored Mbuli and nine others on June 28 for their work in combating “modern day slavery,” to coincide with the department’s release of its annual “Trafficking in Persons” report. The report grades countries on their efforts to combat human trafficking, rather than the overall volume of trafficking occurring in their country. The region with significant improvement is Africa, said Secretary of State Mike Pompeo. However, it is unsurprising which countries ranked the lowest—such as China, Russia, North Korea, Venezuela, Iran, and South Sudan. Pompeo said the “tragic examples” of forced labor in North Korea can also be observed. The United States is a source, transit, and destination country for human trafficking, the report states. 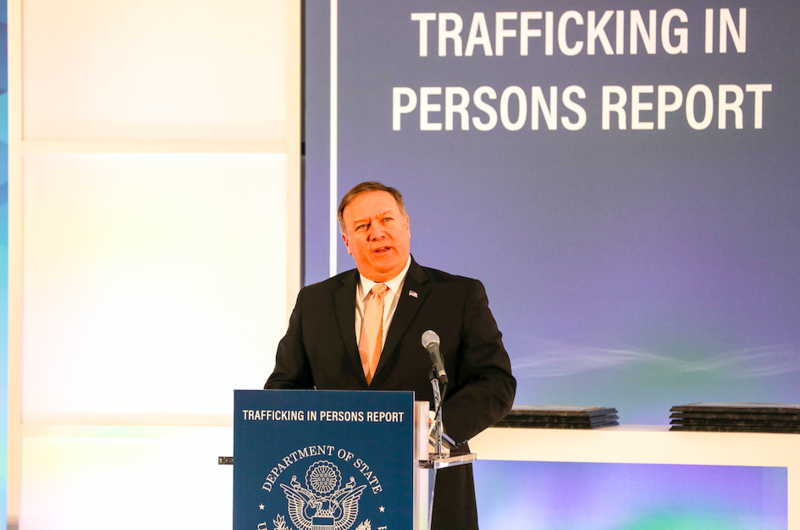 “If were going to win this fight, national governments must empower local communities to proactively identify human trafficking and develop local solutions to address it,” Pompeo said. Human trafficking is often described as a crime that is “hidden in plain sight” because victims may interact with others in the community but are unlikely to self-identify for many reasons, including fear of harm to themselves or their family members, according to the 2018 report. “For example, victims may come into contact with the criminal justice system, seek medical care, attend school or faith services, work in local businesses, or utilize public transportation,” the report states. Any interaction can be a chance to assist. “We have seen again and again that individuals make the difference,” said Kari Johnstone, acting director of the office to monitor and combat trafficking in persons. A personal story in the 2018 report had a good outcome because of an anonymous call to the national hotline. A young boy who was in high school in the Dominican Republic jumped at the chance to go to the United States to continue his education, the report stated, calling the boy “Raul” to protect his identity. A family friend offered to be Raul’s sponsor and hire him in his restaurant while Raul attended school. “Shortly after Raul arrived in the United States and began attending the local high school, his sponsor pulled him out of classes and forced him to work in his restaurant full-time for less than $1 an hour,” the report said. The sponsor was arrested and charged.